Mrs Kraft has checked into the Felton Hotel in San Francisco to find out how Arnett is doing in his search for Laury Palmer's killer. When Arnett stops by to see her, he doesn't notice he is being followed by Sam's friend Marty; with revenge in mind they want to know who hired him. 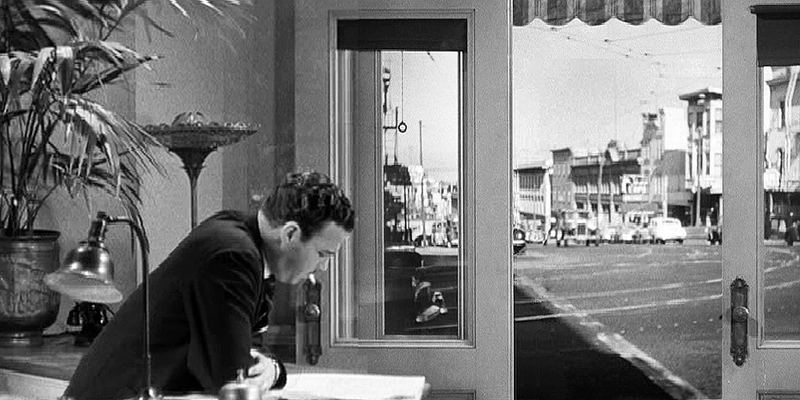 Then ... Once Arnett (and Marty) head up to Mrs Kraft's room the clear view outside gives us clues to the hotel's location. The key one is the barely visible roadway and tower of the Bay Bridge way in the distance so this must look east down Broadway, the block across the street being the 700 block between Stockton and Powell. The hotel though is a virtual location, shot in a studio using a projected background filmed from the northwest corner of Powell and Broadway (map). ... and Now, in the same view today we can still see, in addition to the bridge, 705 Broadway (at left within the open doorway above) and 781 Broadway (at far right with the same exterior fire escape ladder). Everything between them was replaced in 1961 by the second phase of Chinatown's Ping Yuen low income housing project. In the center of the open doorway there's a cafe sign - not quite legible but it was the Jai-Alai Cafe at 761 Broadway. ... a vintage photo ... in this 1940s photo there's a clear view of the Jai-Alai cafe sign at left on the 700 block of Broadway. Compare it to the distant view in the Now image above. ... and Now, the real business currently at the virtual site of the Felton Hotel is Souffle's Cafe at 1401 Powell. Note that it too has an entrance set at 45 degrees on the corner. ... a vintage photo ... because this is the old Ferry Station Post Office on the corner of Washington, seen here at far left in a 1965 image of the ill-fated double-decker Embarcadero freeway. So Pier 1 is the pier seen above, it is just off the left of the picture. ... a vintage photo ... the arrow in this 1947 image taken from the Mark Hopkins hotel points to the Post Office and Pier 1 but Mrs Kraft's window view appears to have been taken from a lower, closer vantage point, perhaps from one of those buildings on the left. In the real world this same view would not be seen from the virtual location of the Felton Hotel, several blocks to the north. ... and Now, the Post Office is no longer there, it used to sit within what is now Sue Bierman Park. But Pier 1 is still there, facing Washington Street (map).